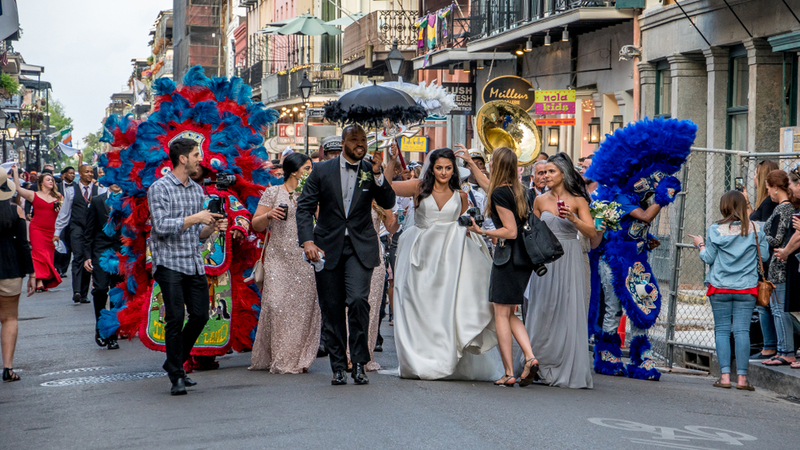 If you’re looking for that special something you can’t find anywhere else for a destination wedding, New Orleans fits the bill. It’s unlike any city in the United States, offering Old World charm that’s accessible to everyone. Plus, the Big Easy is in a constant state of celebration, whatever the occasion. For happy guests, gorgeous wedding photos and vibrant local flavor, there’s nothing more memorable than a wedding in New Orleans. Here’s why. The French Quarter is a patchwork of cultures that shows French, Spanish, Victorian and southern architecture. What other historic city in the US has been so supremely conserved? Its beautiful scenery is classic but not stuffy. Not only does this make for excellent photo ops, it also allows you leeway to customize the exact feel you’re going for. If you’re torn between a rustic wedding or something a bit more traditional, New Orleans is a little bit of everything. Whether you’re looking for a small venue or renting out a gorgeous courtyard within the Quarter, the city is easygoing, versatile, and effortlessly accommodating. There’s a wide range of venues in New Orleans. At Hotel St. Pierre, we offer an intimate wedding ceremony and reception in our quaint Burgundy Cottages set in the heart of the French Quarter. Our private courtyard by our historic carriage houses can accommodate up to 30 guests. Learn more about prices or request a proposal. If guests are traveling for your wedding, you want it to be worth the trip. With a wedding in New Orleans – especially in the historic French Quarter – everyone will be happy. Whether guests want a taste of the outdoors with a swamp tour or recreation in Audubon Park, there’s something for all ages – see our downtown family guide for more. We’re also one of the best food cities in America, with history to boot. Friends will also be satisfied with the active nightlife of the French Quarter, which keeps the party going every night of the week. Ever heard of a second line parade? It’s a New Orleans tradition and the most festive way to celebrate this new walk of life. Let a brass band lead you and your beau through the French Quarter followed by your loved ones. It’s a magical way to celebrate this new chapter in your life. Want to learn more? Check in with second line coordinators for all the information. Planning a trip to New Orleans? Check out Hotel St. Pierre, an affordable, historic hotel located right in the heart of the French Quarter.